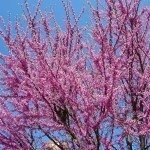 I planted a redbud tree in my backyard three years ago. I'm not sure what variety it is. The first year it only had a handful of flowers. Each year it gets more flowers, but at the same time it gets leaves. Others I have seen get flowers first, then leaves. The branches have grown long and hang down low. Last night we had some rain and wind. One of the top branches broke. The others are touching the ground. Is this typical? Should I have been pruning it? Do you think it will survive now that a major branch broke? I live in Chester County in Pennsylvania. Zone 6.
t does sound like your tree needs some pruning to bring it back to a better shape. The broken branch could effect the tree by causing stress. Watch for any signs of insects or disease at the site of the branch loss. Do not try to cover the wound left by the branch. Allow it to heal.